If you’ve just joined this series of Everyday Occasions cards, you can see the 16 cards created from this kit in my previous four posts, beginning Monday, August 18th. Wow! 16 cards PLUS the 10 cards made in the workshop, for 26 cards total, and I STILL have stuff left. If you’re ready for more, I have the last four cards for you! 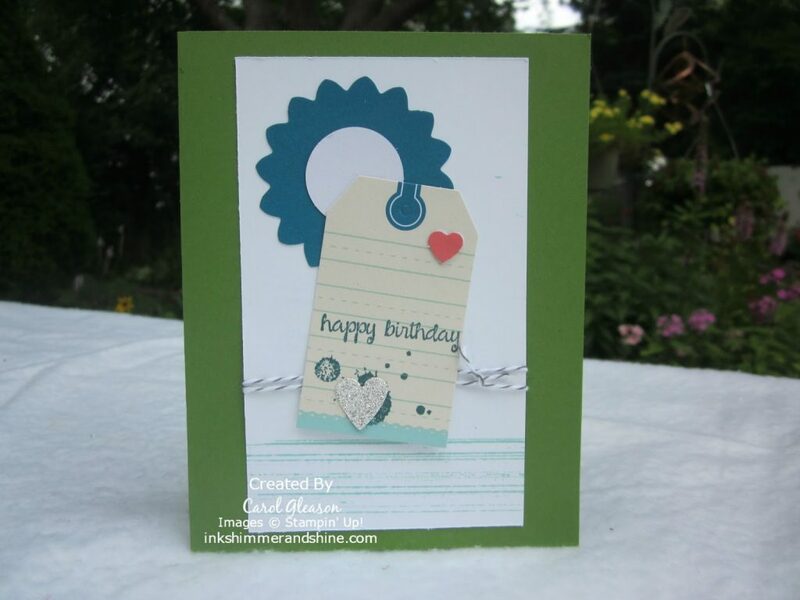 Card #17: Since I send a lot of birthday cards, I was inspired to make one using the Gumball Green, Pool Party, and Whisper White color scheme from the sample brochure. The Whisper White card stock measures 3” x 5” and is from my scrap bin. I stamped the lines from the Gorgeous Grunge stamp set in Pool Party and the splotches in Island Indigo. 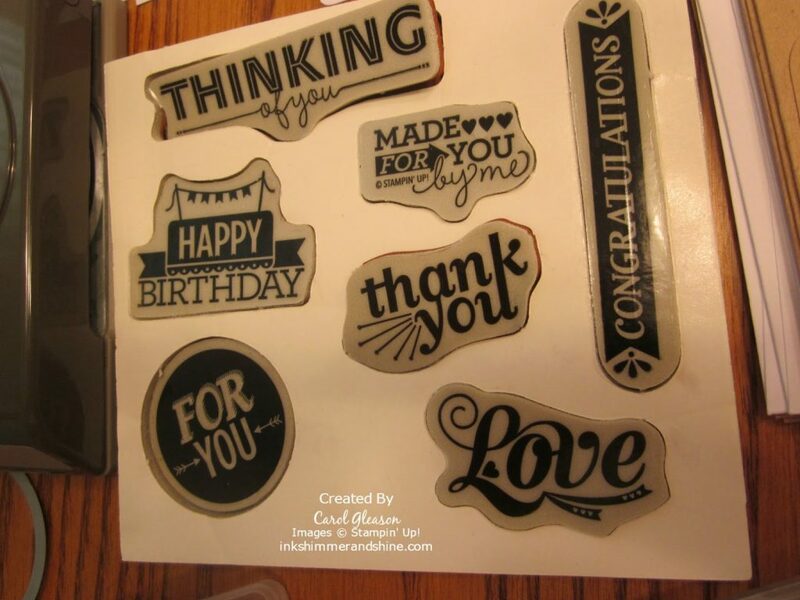 The sentiment is from the ‘And Many More’ stamp set. The mini heart I believe is from the Framed Love Paper Pumpkin kit and everything else is from Everyday Occasions. Card #18: Next I wanted to create a card similar to the gray Congratulations card, but I’m out of Basic Gray card stock after making the 3” x 3” cards (Sigh!). I’ll be placing an order today! 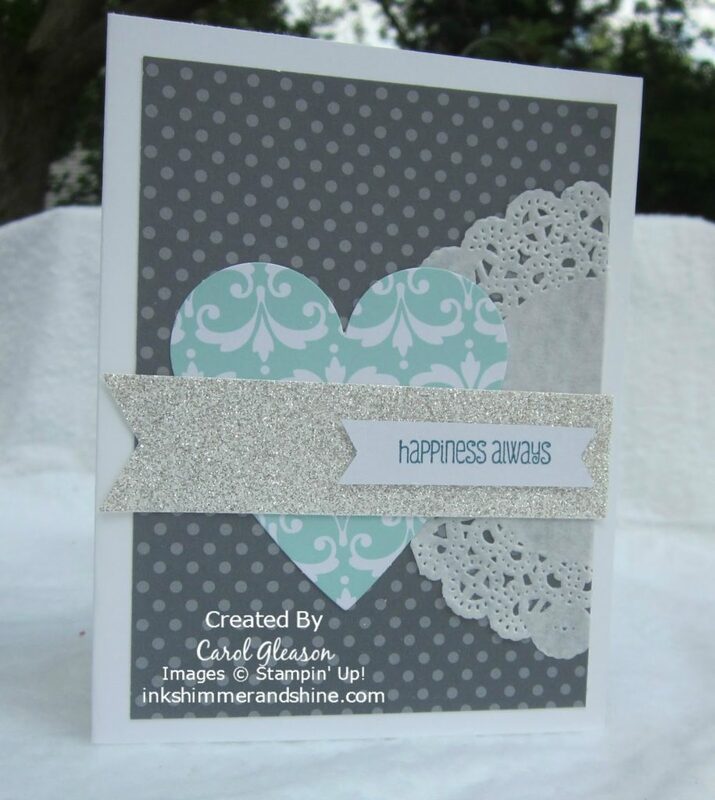 To create a similar look, I cut a polka dot piece of basic gray from the retired Neutrals Designer Series pack to 5” x 3-3/4” (Oops – I meant to cut it to 5-1/4” x 4”!) Oh well! I added the Pool Party heart, half of a doily, and the large silver glimmer banner from the kit. Then I stamped the sentiment “Happiness Always” from the set ‘And Many More’. This time I left everything flat for easy mailing, to be used as an anniversary or wedding card. Card #19: This time I was inspired by the striped Pool party paper in the kit, so I dug out a similar piece from Comfort Café Designer Series Paper (retired) to put on a Very Vanilla card base. All the other pieces are from the kit, and the layout was inspired by the first card in the brochure. Card #20: This is it! The last card in the series. I have 2 feathers left from the kit, so I’m using them, along with the sample from the brochure, for this last card. Since I don’t have any Kraft paper, which is new in the catalog this year (another item to add to my order), I’m using Crumb Cake as an alternative for the card base. 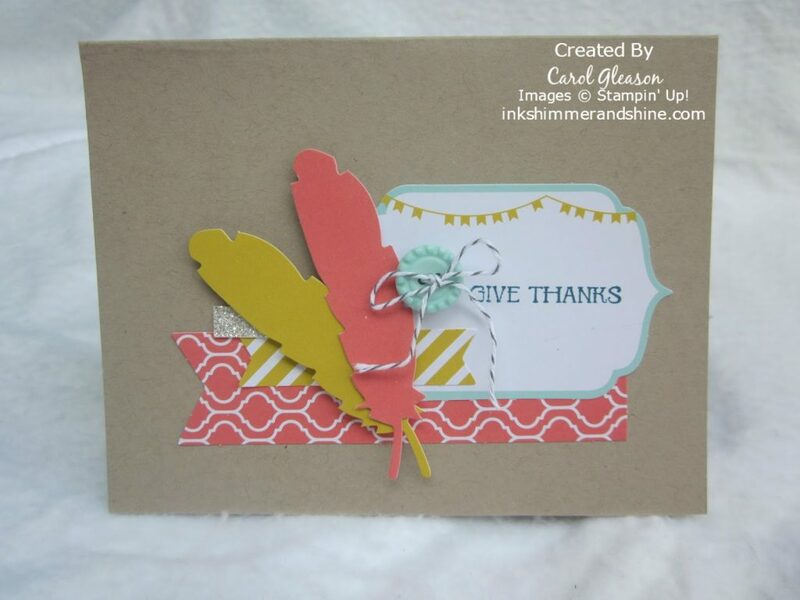 With Thanksgiving coming next quarter, the feathers seemed appropriate, along with the Give Thanks sentiment from ‘And Many More’ for this card. The layout mimics the sample, except I moved my button a bit to balance out the smaller sentiment that I chose. So there you have it! 20 sample for the Everyday Occasions card kit, using 3 colors of ink: Island Indigo, Pool Party and Smoky Slate/Basic Gray, a couple of punches or dies, the sentiments shown above, as well as Gorgeous Grunge, And Many More and Teeny Tiny Wishes and maybe some card stock, DSP, twine or embellishments from your stash. 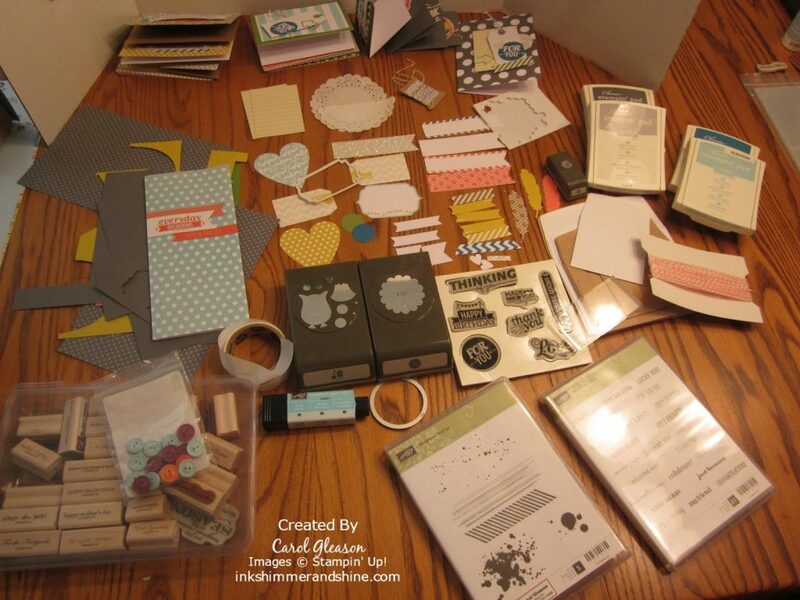 The photo below shows most of the products used to create all of the cards in this series. I’ve included links underneath the photo to all the products in my online store, in case you need a few items to get started on your own card-making marathon! I hope you’ve enjoyed seeing my samples as much as I’ve enjoyed sharing them with you! I have lots of ideas now for using up some more of the Designer Series Paper I’ve collected in the past three years, but I think I’m ready to change color schemes at this point. Now go and be creative, then share what you’ve made! And Many More, punches, Teeny Tiny Wishes. Bookmark.